This reading and listening exercise is about the Spanish festival Las Fallas de Valencia. This is suitable for level B1 Spanish students. All Spanish fiestas are known to be noisy affairs. 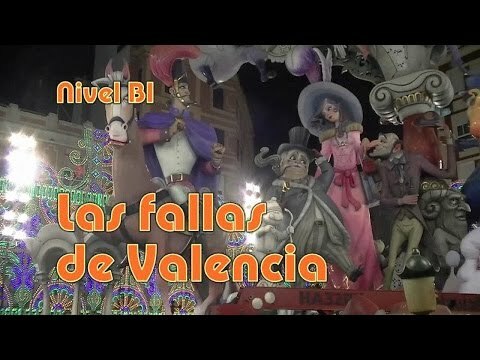 None more so than Las Fallas de Valencia! The fallas themselves are the statues that are filled with fireworks and firecrackers and which are ultimately burned. As well as the expected music and dancing that take place throughout, there are falleros (name given to everyone who participates in las fallas) who dedicate themselves to making noise in the morning to wake you up, there are fireworks at night, and on top of the firecrackers set off by kids in the street there is the massive mascletà: a huge pyrotechnic display that takes place in the afternoon involving massive firecrackers called masclets and noisy rockets and fireworks that also create a visual display of coloured smoke plumes. The main festivities last five days, starting on 15 March and ending on 19 March, Saint Joseph's day. Watch the video below to see just how much Valencia manages to pack into five days of pretty much non-stop partying! Watch the video, then read the transcript. You can choose to have no subtitles or to turn on the Spanish subtitles by clicking the cog icon to access the Subtitles/CC option. Click any phrase for the translation and links to related grammar lessons which you can add to your Kwiziq notebook to practise later. How did you find this exercise? Leave a comment below - we love getting your feedback! Login .I am new to this...once I log out , do I log(back)in with email or name? You log back in with the same email you registered with.